Marmite GUINNESS, originally uploaded by DragonDrop. where did you find it? is it rather nice? or is it a disgusting mixture extra thick baby bio and dehydrated beer concentrate. I love Marmite. Used to eat it all the time when I lived in Canada. It would be better if it did have a little alcohol in it. And my palette says uh urgh to marmite. Are you going to do a guess my drink with it? That’s funny. I think I was the only one in Canada who liked it. Now, if you could re-constitute it with water to make a genuine pint… I would be impressed. 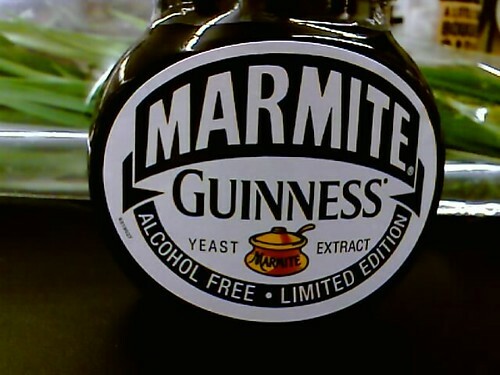 Oh My God, as if marmite/Vegimite (Which my Australian Girlfriend used to constantly eat) is not bad enough, they have added Guiness to it? What has Humanity done to deserve this? pM Waitrose, it’s rather nice, if you like that sort of thing (which I do on both counts) It’s taste is 95% marmite, 5% guinness I’d say. mimpy Most things are better if they have alcohol in them. frogdog1 may skip guess my drink with this one! fgt yep! Thanks for the tip off (readers – it was in fgt’s stream where I first caught sight of the wonderful stuff. jimmytofu it may be just a gimmick, but it’s a rather nice one. maverichapollo Ha! – you must fall into the ‘hate it’ camp. Polerized foodstuffs are cool things. I’ve found Marmite in Japan, but it’s about £5 a pot.